Not far from the local office of GUARDIAN, Milaap’s field partner in Musiri, Trichy, is the home of one borrower, Valarmathi. Living in a town that is plagued with water scarcity, she has had to make judicious use of the water that was made available from the public standpost. To ensure an equitable distribution of water and to increase the productivity of the residents, the local town panchayat began installing water connections in individual homes. Not to be left behind during the drive, Valarmathi obtained a loan to pay the installation fee for installing a water connection. More than a year on, she is glad that she made that investment in her family’s welfare. “All the people on this side of the street would fill water at the public standpost,” she said, pointing in its direction. The standpost was located a good 50 metres away from her home. “We are three in the family and we require at least 10 or 15 pots of water a day to meet our basic needs,” she continued, “as you can imagine, it wasn’t an easy task for me to carry water everyday. My son used to help me when he was smaller but now that he’s working, it would be harder for him to help.” With a fixed water connection that leads all the way to a collection tank in her house, Valarmathi’s family’s water needs are secure. She receives water for an hour in the morning every day, and she gets more water than she requires now. But, she still remembers the times when water was scare and her habit of judiciously using water is unchanged. Valarmathi thanked us for the opportunity of availing a loan to install a water connection in her home. Encouraged by the utility of the first microloan, she went on to obtain a second - this time to build a toilet in her home. 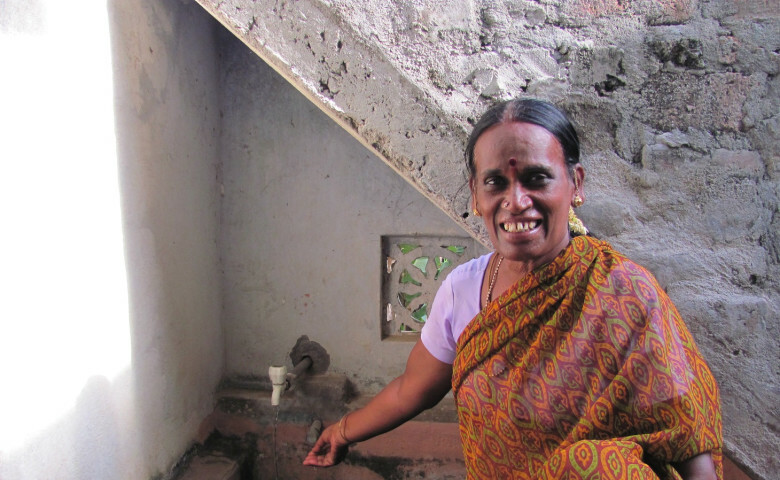 Taking advantage of the opportunities to install water connections and to build toilets offered by GUARDIAN, Valarmathi now leads the way for her neighbours and relatives who are looking to make healthier choices by improving their family’s hygiene. Correction: Due to a data entry error by our field partner, the wrong photo of the group borrowers was uploaded at the time of funding the loan on our website. We are working closely with our field partner to eliminate such errors in the future. The error is deeply regretted.